In January 2019, CG&A COMMUNICATIONS celebrated its 25th birthday. To commemorate the occasion Chris George reflects on the company’s development. This is the third installment of a five -part series that chronicles the growth of the company. The next five years (2004 – 2008) were an adventure in establishing CG&A COMMUNICATIONS as a company with home offices spanning from Montreal to Niagara Falls. Technology is an enabler for a company like this one. The phone, Internet and e-mail allowed our consultants to collaborate and deliver communications services to anywhere in a timely manner. Many clients did not require us to physically be in their offices – and often, our consultants completed contracts without ever having a face-to-face meeting. So, what was once an oddity to have a virtual corporation linking a group of consultants is now an accepted practice. Our new Niagara office resulted in important new connections in southern Ontario. CG&A COMMUNICATIONS was able to provide a greater turnkey communications service with the growth of our network. We were pleased to have been working with a superb printing expert Robert Van Wyngaarden, copy editor Alexandra Cormier, and wordsmith Pamela Cicci, not to mention our working relationships with senior communications project manager Sue MacGregor, as well as a planning and promoting specialist Andy Donovan. These additions complemented our core consultants and helped forge an integrated network of like-minded professionals, permitting the company to concurrently manage a number of projects with diverse communications objectives. The company’s multi-talented group of consultants and partnering associates is, unquestionably, its greatest hidden asset. For many years, Mothers Against Drunk Driving (MADD Canada) was one of CG&A COMMUNICATIONS’ core clients. For 14 years, our consultants provided communications services and played an integral role in the policy agenda of this Canadian charity. 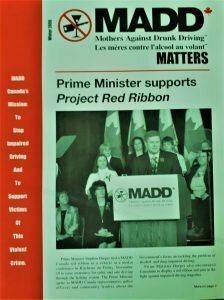 In 2006, our efforts culminated in having the MADD organization and impaired driving policy nationally showcased with Prime Minister Stephen Harper launching MADD Canada’s annual red ribbon holiday awareness campaign. More importantly, through 2006 and 2007, we helped to coordinate and facilitate MADD Canada’s involvement with the passage of important new impaired driving legislation. The new federal laws dealing with drug impaired driving and the elimination of the two-beer defence were issues MADD Canada had fought for more than 8 years! Likewise, CG&A COMMUNICATIONS’ long-serving efforts on behalf of the Copyright Consortium of the Council of Ministers of Education, Canada (CMEC) resulted in the introduction of essential federal copyright legislation in 2008. The internet amendment the education community in Canada sought was included in the new copyright legislation. Although the Conservative Government’s original Copyright Bill did not progress through Parliament, a new line in the sand was drawn so students and teachers – and all learning Canadians – can be more hopeful that the federal government is listening to their needs when considering digital copyright matters and Internet use in the classroom. Another one of CG&A COMMUNICATIONS’ long-standing clients that saw some very interesting developments over the years is Commissionaires Ottawa. Originally retained to write and produce its newsletter and internal communications pieces, Managing Partner Andrée Paige led a group of consultants to help position and promote this private security force serving the National Capital Region, the Ottawa Valley and Northern Ontario. From expanding its range of identification services, to establishing itself as an authority with emerging security issues, Commissionaires Ottawa grew in stature and was publicly recognized as the largest, best trained and most experienced private security force throughout its service territory. Based on our work with Commissionaires Ottawa, CG&A COMMUNICATIONS also provided services to other Divisions across the country, as well as the national organization and its National Business Management Committee Chairman. CG&A COMMUNICATIONS continued to have its share of new clients. 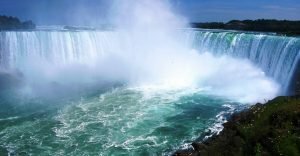 In Niagara / GTA, the company provided both communications counsel and services to the senior management of the Niagara Parks Commission; wordsmith and internal communications counsel to ACCO Canada; and strategic planning advice to the Independent Pharmacists of Ontario. In Ottawa, the company provided promotional services for the Geriatric Psychiatry Community Services; media relations for the opening of the Ottawa Mindcare Clinic; and, the planning and promotional support, media relations and logistical services for the inaugural Run for Military Families event from Ottawa to CFB Petawawa. There has also been work involving the Kensington Technology Group of California. Within the last year, CG&A COMMUNICATIONS worked on many exciting initiatives: the National Roundtable on the Environment and the Economy, media relations for the Canadian Literacy Forum (a cross-country on-line event), and strategic counsel services for the Nova Scotia Educational Leadership Consortium. Most recently, CG&A COMMUNICATIONS was selected by the West Lincoln Memorial Hospital to develop a long-term communications plan for the construction and opening of a new hospital building serving Grimsby and the western Niagara community. January 2009 marked 15 years. Gone is the blue shag-rug and one-room office along the Ottawa canal. That office resembles nothing of our business today except for the vision and enthusiasm of its core consultants. We take great pride in being reliable and ‘a cut above.’ We appreciate and work hard for our clients’ trust. Our results speak to the personal attention and involvement of our braintrust in not only the counsel and planning of our clients’ communications initiatives, but also in the implementation details of our strategies. It’s been a great journey to reach the 15-year milestone, and we are anticipating more fun and excitement on the road ahead. Thank you to all who support or in some way have been involved in, CG&A COMMUNICATIONS!